Kabara craftsman Taniela Gu working on the 'Drua' at their Valelevu home yesterday. Inoke Galu, 39, has sent a message to his elders back home in Kabara that their traditional knowledge about craftsmanship are being successfully passed on to the younger generation. To prove this, he has completed building a three-foot drua (double hulled canoe) which he started after his father's death. 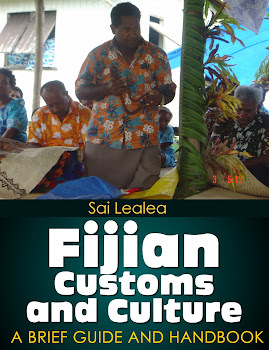 It was two years back when Mr Galu and his father Jone Lupe had built their first three-foot drua which was exhibited during the Melanesian Art Festival in 2006. "It took us three weeks to complete the drua. Then within the next three months after completing the first drua, we built three more each measuring 10 metres in length," Mr Galu said. "I was inspired by my old man's craftsmanship and I challenged myself to build a canoe by myself to prove to my elders and my village that their knowledge was still being successfully passed on to the younger generation." He started working on the drua six months ago. "It is taking me long but my father's works inspire me to complete it. I am doing all the work by myself and I appreciate the help I receive from my uncle Taniela Gu." Mr Galu said the survival of such skills was important to his Lemeki Clan in the village of Naikeleyaga in Kabara. He used materials including mahogany from the land of some landowners in Valelevu, and coconut husk (magimagi) as the binding. "I have not used any modern materials in the art because I wanted to use the traditional methods. I have also placed the traditional Fijian designs to decorate the canoe." "I believe building such art helps retain the cultural backgrounds. These canoes will also suit many resorts which want to add an ancient traditional flavour or as souvenir to their assets," Mr Galu said. He was also interested in selling his art and receiving contracts for traditional art.